William J. (Bill) Bennett served as Secretary of Education and Chairman of the National Endowment for the Humanities under President Reagan and as Director of the Office of Drug Control Policy under President H.W. Bush. After leaving public service, Bennett has been best known for his publication of two collections of stories of moral instruction—The Book of Virtues in 1993 and The Moral Compass in 1995. These books were very well received at a time when many Americans had long perceived a trend of moral decline in American culture, and particularly when the President of the United States at that time, Bill Clinton, had exhibited acute moral deficiencies. “In the end” Bennett wrote, “the president’s apologists are attempting to redefine the standard of acceptable behavior for a president. Instead of upholding a high view of the office and the men who occupy it, they radically lower our expectations.” It is appropriate that Bennett used the word “our,” for his own expectations have been so lowered that he is now an apologist for Donald Trump. As Bennett recently explained to FOX News, those who refuse to support Trump “suffer from a terrible case of moral superiority and put their own vanity and taste above the interest of the country.” It appears that it was never really about the moral integrity of the president at all. It was, as it continues to be, about factional politics and Bennett’s and like-minded others’ reactionary worldview. Most interesting is the split among evangelical Christians that has emerged from Donald Trump’s candidacy. While perhaps most Christians are rejecting Trump because of his moral vacancy and/or his irrational understanding of the world, others have not. In fact, a great many self-described Christians—some in prominent positions, like Bennett—are actively supporting his candidacy. Christian author Eric Metaxas, for example, has espoused Trump’s election so that he might appoint the next two or three Supreme Court justices. But surely Metaxas is aware enough to recognize that those appointments would unlikely result in a reversal of Roe-v-Wade or gay marriage (as we can assume he wishes). Even if those reversals did occur in some distant future, that would only allow the states to pass or not pass their own prohibitions, and we know that not all states would prohibit abortion. Women could then travel to the states where it was available or to Canada. Some, of course, would not be able to afford the cost of travel and would either give birth to unwanted children into poverty or seek illegal (and dangerous) abortions, while only a minimal number of healthy babies would be adopted into stable families. A reversal of gay marriage, on the other hand, would be completely futile. Given that more and more people are coming to recognize that homosexuality is not simply “a lifestyle choice,” most all states would soon legalize gay marriage anyway. So that really just leaves us with a preference for Trump’s policy proposals on immigration, international trade, foreign policy, defense, taxes and regulation—policies that, in many instances, run counter to traditional Christian values. We need not detail the many problems with Trump’s proposed defense policies beyond noting that an isolationist stance, an official sanctioning of torture, and a weakening of NATO will hardly make America safe, much less great. It is also worth noting that if Trump can be so easily manipulated by Billy Bush (as proclaimed by Melania), then we can well imagine what Putin and other world leaders could do (beyond what we have already seen). Trump’s tax policy is nothing new. It’s essentially the same philosophy as that of George W. Bush, just much more extreme. Though a reduction in corporate taxes could be of some benefit, his personal income tax proposal won’t help the poor or reduce income and wealth disparity. It also won’t help the economy, since it would explode the deficit and national debt to dangerous proportions. And it won’t prevent the next recession, just as it didn’t from 2007 to 2009. The notion that regulations have shackled the American economy, as Trump claims, is mostly false. His regulatory policies would increase the risk of another financial crisis and, perhaps most importantly, his denial of well-founded science will likely prove detrimental to the wellbeing of future generations of Americans and vulnerable populations around the world. Trump would repeal the Affordable Care Act in its entirety, not because its problems are irreparable, but because his disdain for President Obama far exceeds his compassion for those who struggle to afford health insurance. Of course Trump’s first and signature policy proposal—immigration reform—is not just irrational, it, along with his trade and foreign policy proposals, were conceived from a particularly un-Christian, xenophobic worldview. Trump imagines that illegal Mexican immigrants are “pouring across the border” and he intends to stop it with a great wall. The net flow of illegal immigrants from Mexico is actually currently near zero. Illegal immigrants come from many other nations, and a wall would have little effect. He imagines that illegal immigrants are increasing crime and come for government handouts. The reality is that illegal immigrants commit crimes at a far lower rate than the general population, and come for available jobs, not handouts. We do tend to pay for their use of emergency room services and public schools, but would any true follower of Jesus really deny poor children an education and medical treatment? Perhaps the two most important Biblical mandates for how Christians are to interact with others in the world are to be compassionate and merciful, and to spread the Gospel. Trump’s immigration and refugee policies reject both. To prohibit Muslim refugees demonstrates a lack of compassion and it precludes the Christian duty to proclaim the Good News to those who haven’t had an opportunity to hear it. We can dismiss Donald Trump’s sophomoric insults and his boasts about his adultery and assaulting women as “locker-room banter,” or we can see them as indicators of an underlying true character—a character that has been well illustrated over the course of his campaign to be childish, selfish, thin-skinned, vindictive, impatient, shallow, unprincipled, dishonest, iniquitous and racist. Of course it is no accident that white supremacists favor Trump for president, while, despite Clinton’s deficiencies, nearly two hundred prominent Republican current and former office holders, senior government officials, and intellectuals do not. So why do some Christians? Have you ever wondered why penguins are only found in Antarctica and the Southern Hemisphere, not in the Arctic or Northern Hemisphere? The climatic conditions and the requisite resources are similar enough that penguins could flourish in Norway, Iceland, Greenland, Alaska, or Siberia. So why are they absent? Humans. The word “penguin” was originally used in association with a Northern Hemisphere flightless bird called the great auk. Standing as much as two and a half feet tall, with diminutive wings that had evolved for swimming and sporting black and white plumage, they resembled the penguins we know today (though they were from a wholly different family of birds). When European explorers began regular ventures to North America early in the sixteenth century, the birds could be found in abundance on and around Iceland and on tiny Funk Island off the coast of Newfoundland. Though fast swimmers, like today’s penguins, they had to waddle ashore to breed and incubate their eggs, leaving them very easy to catch. Explorers filled their ships with vast numbers of great auks to be used for the birds’ meat and feathers. Their oily bodies even made them suitable as fuel for fires. If you come for their Feathers you do not give yourself the trouble of killing them, but lay hold of one and pluck the best of the Feathers. You then turn the poor Penguin adrift, with his skin half naked and torn off, to perish at his leisure. The last great auks to be seen alive were in June 1844, when a small group of sightseers rowed to a tiny island off the shore of Iceland. By then, the birds’ rarity had made them valuable to collectors. In rough seas, only three men managed to get ashore. Upon seeing the humans, a single pair of auks made an effort to run, but they were quickly caught and strangled. The single egg the pair had been incubating was evidently cracked in the struggle and so was left behind. The story of the great auk is but one among many such tales of human history. Similar fates befell the Dodo bird, Passenger pigeon, Elephant bird, Giant Moa, Carolina parakeet, Tasmanian tiger, Falkland Island wolf, Zanzibar leopard, Caribbean monk seal, Atlas bear, Sea mink, Steller’s sea cow, Baiji white dolphin, West Africa black rhinoceros, Woolly mammoth, Mastodon, and a great many more species that were extinguished by human sport or consumption. Superstition, greed, callousness, and short sightedness today are threatening the extinction of many more species. Economic growth in Asia has been accompanied by greater demand for rhino horn (foolishly believed to be an aphrodisiac and a cure for cancer) and for ivory (seen as a status symbol and an artistic investment). Since 2008 in South Africa alone, some six thousand increasingly rare rhinos have been poached just for their horns. Tens of thousands of African elephants are killed each year by poachers, some of whom have been known to use automatic weapons to wipeout entire herds, including the calves, just to steal the ivory. Day after day, Chinese fishermen in the South China Sea near the Philippines are intentionally destroying coral reefs that took five to ten thousand years to form, in order to harvest rare, hundred-year-old giant clams. New wealth in China is making trade in endangered species, including the critically endangered Hawksbill sea turtle, more lucrative than fishing. Most species extinction resulting from human activity, however, is not the direct result of the harvesting of those species, but is merely the side-affects of the expansion of human civilization. As we harvest old-growth forests, deplete fish numbers, expand cities and agricultural tracts, and build a multitude of roads all over the planet, ecological habitats are altered, severed, or totally lost, leaving the species that depend on them to adapt or perish. Many have perished. Even the plants, animals, bacteria, viruses, and fungi that humans have carried (intentionally or inadvertently) around the world, have affected the viability of a great many local species. For the last two centuries, growing emissions of greenhouse gasses have—and increasingly will—alter the atmosphere in ways that add stresses to a great many species, not to mention some human populations. A recent study by the Zoological Society of London and the World Wildlife Fund concluded that wildlife populations (of the 3,700 species of birds, fish, mammals, amphibians, and reptiles studied) have declined by 58 percent in just the last 45 years. Though it may be difficult for many people to imagine, we are living in the midst of The Sixth Extinction—an event preceded by five similarly devastating mass extinction episodes over the course of the 3.6 billion-year history of life, such as the so-called K-T event when an asteroid impact is believed to have resulted in the demise of a large percentage of the Earth’s organisms, including the dinosaurs. Through fossil fuel combustion and deforestation, humans have significantly altered the composition of the atmosphere. So the questions at hand are: Is this something to be truly concerned about, and is there anything we can realistically do about it anyway? 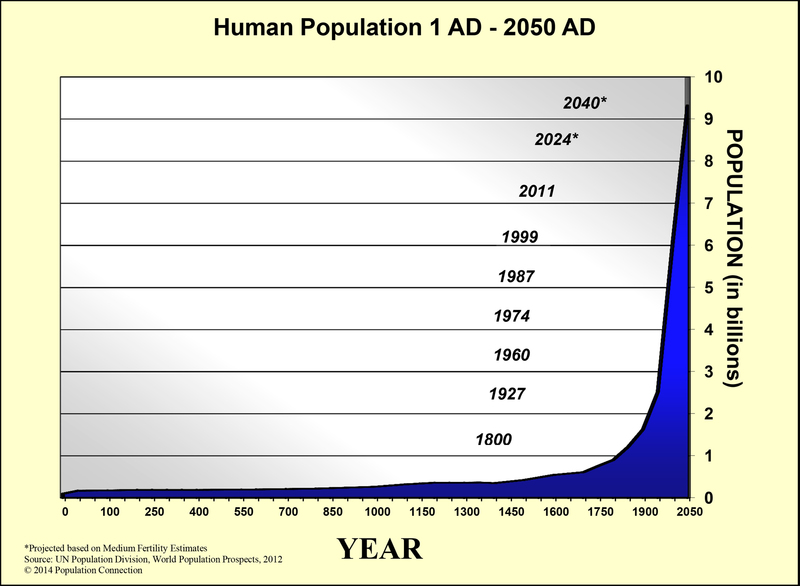 In 1968, a bestselling book by Stanford University Professor Paul Ehrlich, entitled The Population Bomb, warned that humans would experience massive starvation and other calamities due to overpopulation as early as the 1970s or 80s. The alarmist tone and wildly inaccurate predictions of the book (among other books) only served to discredit the cause of population control in the minds of many. In the 1980s, support for worldwide birth control initiatives in the United States Congress was supplanted by the politics of abortion. Ironically, as opposition to abortion grew, so did opposition to government sponsored birth control programs, despite those programs propensity to reduce the incidents of abortion. Today, there is little discussion of population control issues in the public arena. In fact, among highly developed nations, a lack of population growth is of some concern. Birth rates tend to fall in prosperous nations, resulting in a demographic imbalance of the young and the old. A large population of pensioners is difficult to support with a minority of young people. This is the main reason that China is now abandoning its one-child mandate. It has induced a reduction of pension benefits within the wealthy nations of northern Europe. And it is becoming a strain on our own Social Security system (though that strain has been somewhat mitigated by a regular influx of legal and even, dare we admit it, illegal immigrants). Nevertheless, if overall human population growth is not significantly mitigated very soon, we can be sure to expect an increasing number of conflicts over the world’s resources. (Note what China is now doing in the South China Sea to claim disputed islands, in an effort to secure the associated oil resources.) Our, and particularly our descendants’ quality of life will undoubtedly be diminished in any number of ways. There is little doubt that human ingenuity, particularly that of capitalist motivations, can make the necessary accommodations for a great deal more population growth. Most developed nations can remain sufficiently fed and even comfortable. But what will be the character of the world in which we choose to live? Do we not also wish for the wellbeing of all the world’s populations, and do we not have a stake in preserving the natural state of our own surroundings and resources? Do we want a synthetic Brave New World? Or do we want to protect the natural Earth from which humankind arose to ponder the universe and our own role and accountability within it? This we know: the Earth does not belong to man—man belongs to the Earth. All things are connected like the blood that unites us all. Man did not weave the web of life. He is merely a strand in it. Whatever he does to the web, he does to himself. For a more thorough account of the great auks as well as many other cases of human induced extinction, I recommend Elizabeth Kolbert’s Pulitzer Prize winning book, The Sixth Extinction: An Unnatural History. *Though commonly attributed to him, it is doubtful that Chief Seattle actually spoke those words. I have nevertheless included them because they well reflect a widely held view among a number of Native American tribes concerning the symbiosis of humankind, other creatures, and the natural world.